It’s the first day of winter. The sun shines like the moon through the clouds around noontime. It’s almost gloomy. The only gloomy thing in my life right now is limited funds (until Friday), and, of course, the political current our country is currently in. From GNQ, I ordered homemade lemon-flavored hummus, which was dusted with plenty of black pepper and flavored with lemon juice, tahini and ample garlic. 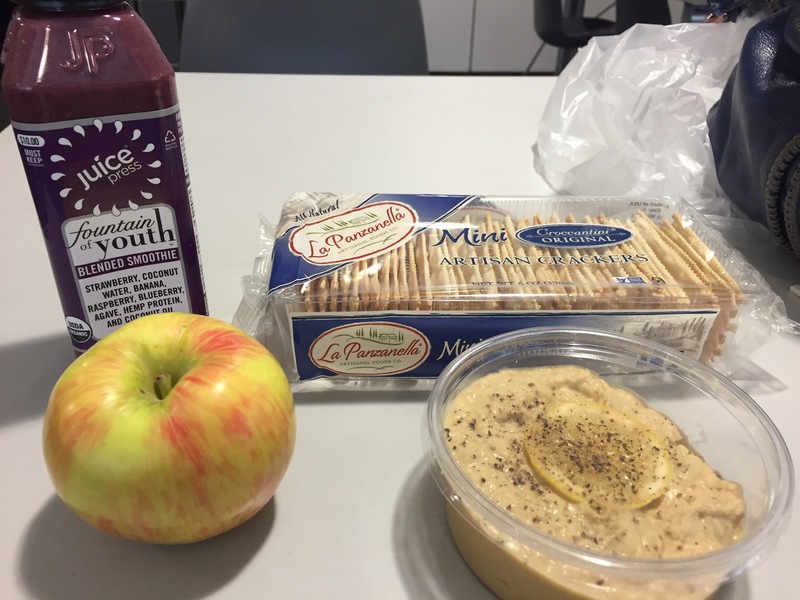 I also bought crackers and a golden delicious apple. The hummus was creamy, fragrant with Mediterranean good tastes and textures. The apple was sweet, juicy, and simply good. Good Neighbors indeed! I tried Juice Press’s Fountain of Youth, a smoothie that contained strawberry, coconut water, banana, raspberry, blueberry, agave, hemp protein (really? that’s a thing?) and coconut oil. I hope this dash of protein/vitamins will keep me going for the rest of of the workday, since I’m working late. Enjoy! Happy Winter Solstice everyone!